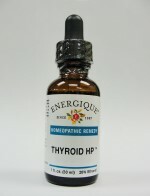 Thyroid HP: is a high potency homeopathic remedy for the temporary relief of symptoms due to thyroid dysregulation, chronic fatigue, lowered metabolism and thyroid dysfunction. Iodium purum 30x, Pulsatilla nigricans 30x, Baryta carbonica 30x, Calcarea carbonica 30x, Thyroidinum 30x, Fucus vesiculosus 30x, Spongia tosta 30x, Natrum muriaticum 30x, Calcarea iodata 30x and distilled water. 20% ethanol.